questions, and many other mind-boggling puzzles and paradoxes. He gives a vivid sense of the difficulties raised by our ordinary ideas about space and time, but he also gives us the basis to think about these problems independently, avoiding large amounts of jargon and technicality. His book is an invitation to think philosophically rather than a sustained argument for particular conclusions, but Le Poidevin does advance and defend a number of controversial views. He argues, for example, that time does not actually flow, that it is possible for space and time to be both finite and yet be without boundaries, and that causation is the key to an understanding of one of the deepest mysteries of time: its direction. 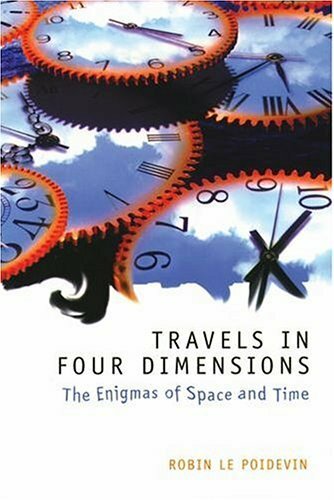 Travels in Four Dimensions draws on a variety of vivid examples and stories from science, history, and literature to bring its questions to life. No prior knowledge of philosophy is required to enjoy this book. The universe might seem very different after reading it. A Box with No Sides? Can the Past be Infinite? Is There Space beyond the Universe? Why Is There Only One Present? No Motion at an Instant? No Motion in the Present? Is Time Order Merely Local? Are Causes Simultaneous with Their Effects?